Whether you’re a dad who’s completely forgotten to plan something for your better half, a mum taking charge of her special day, or simply stumped on what to do for Mother’s Day, we’ve rounded up some amazing activities fit for the occasion (and the entire family). Pick up a new skill at one of Singapore’s oldest surviving kilns. 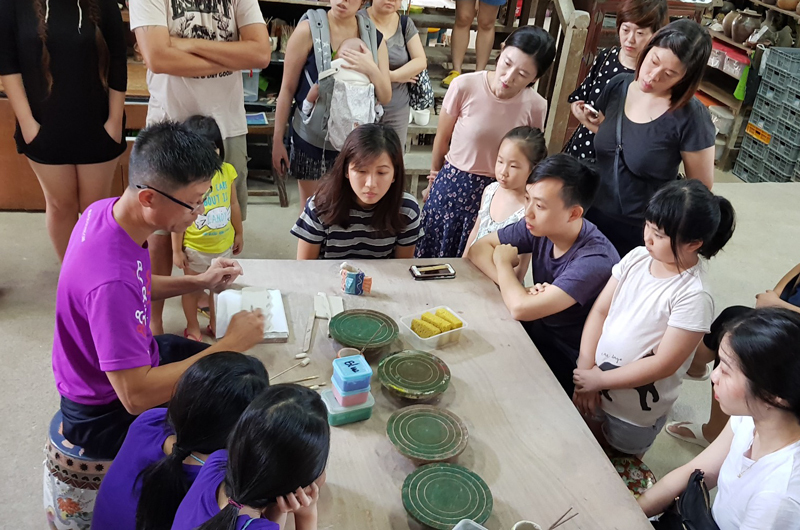 The perfect bonding activity for family members of all ages, the two-hour session will have you learning handy tips and techniques to create gorgeous pieces of art from mere lumps of clay through the traditional process of pottery and firing. If you’re up for a challenge, try your hand at the pottery wheel ­– no prior experience required! The workshop is located at No. 85 Lorong Tawas via Cleantech View, Singapore 639823. Pottery Hand-building tickets start from $28 for children aged seven to 16 years. For young children (0 to six years), opt for the parent + child package at $45. Head here for tickets and more information. How long has it been since you picked up a paintbrush to create your own (not your kid’s!) masterpiece? This Mother’s Day, unleash your untapped creativity on canvas and enjoy a colourful bonding session with your family. Play around with an array of acrylic paints while sipping on a complimentary speciality beverage, and at the end of the three-hour art jam session, head next door to enjoy yummy food at the adjoining café. 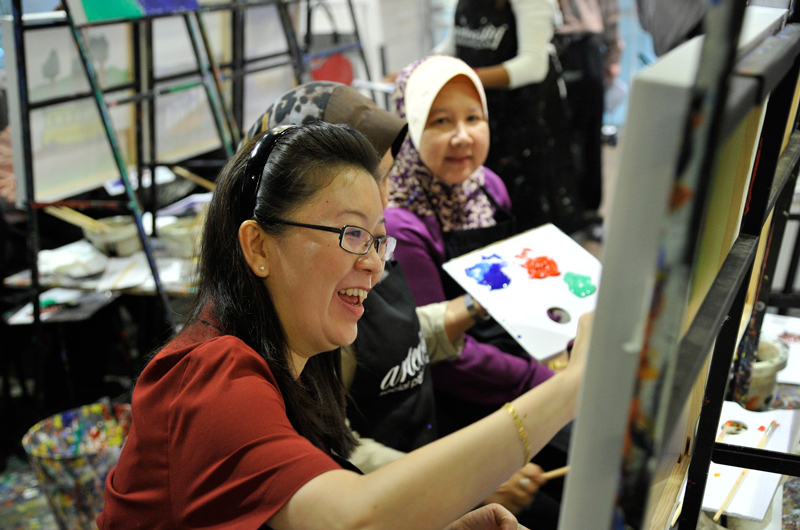 Art jam sessions are available at Mandarin Gallery or Plaza Singapura. Tickets are $45 per pax. Head here for more information. Treat yourself to a visual feast this weekend by signing up for a floral arrangement workshop! 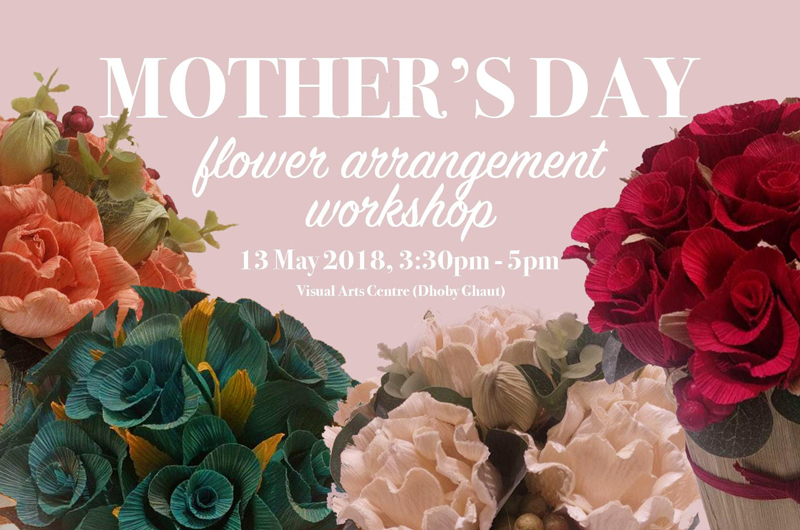 Organised by Visual Arts Centre, participants will be creating their bouquets using sustainable and beautiful flowers made from cornhusks, each individually dyed and crafted by hand. The best part? Your arrangements can be kept for one to two years without having to worry about the flowers wilting! The workshop will be held at the Visual Arts Centre at 10 Penang Road, Singapore 238469 on 13 May (Sunday) from 3:30pm to 5pm. Prices start from $60, group bookings of two or more will enjoy a $5 discount per ticket. All participants will be issued a Basic Flower Arrangement Certificate by Innovart Singapore. Head here for more info. Get back to nature and do your part for the environment by taking part in the fun activities lined up this weekend at East Coast Park! There’s plenty to do for the entire family, including free up-cycling and crafting workshops* where the kids can make their own parachute, grow their own plants, watch a LED bottle lamp making demonstration and more. After which, take a stroll down the Sustainable Lifestyle Market, where artisans will be showcasing their creative crafts and wares. 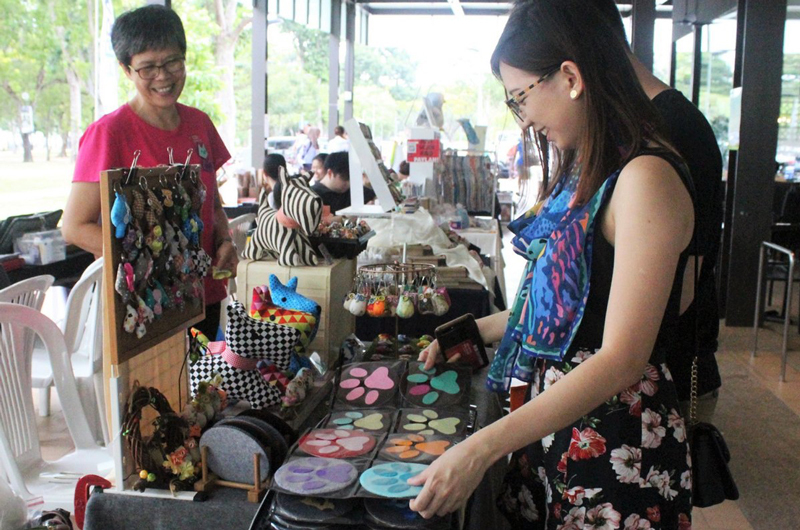 Weekends in the Park: Lifestyle Market & Workshops will be held from 12 to 13 May (Saturday and Sunday) from 11am to 8pm at Marine Cove, East Coast Park Area C2. Head here for more information. *All activities are on a first-come, first-served basis. While stocks last. 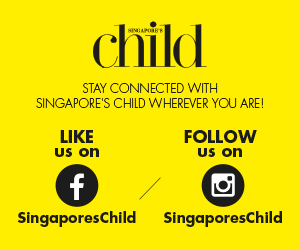 Grab your picnic basket and head to the Singapore Botanic Gardens for an evening filled with love and music! The SSO and Associate Conductor Joshua Tan is slated to perform melodic pieces such as Tchaikovsky’s Polonaise and Gardel’s Por una Cabeza. Guest vocalist Taufik Batisah will make an appearance as well, for Me & Mrs. Jones and P. Ramlee’s Ibu. 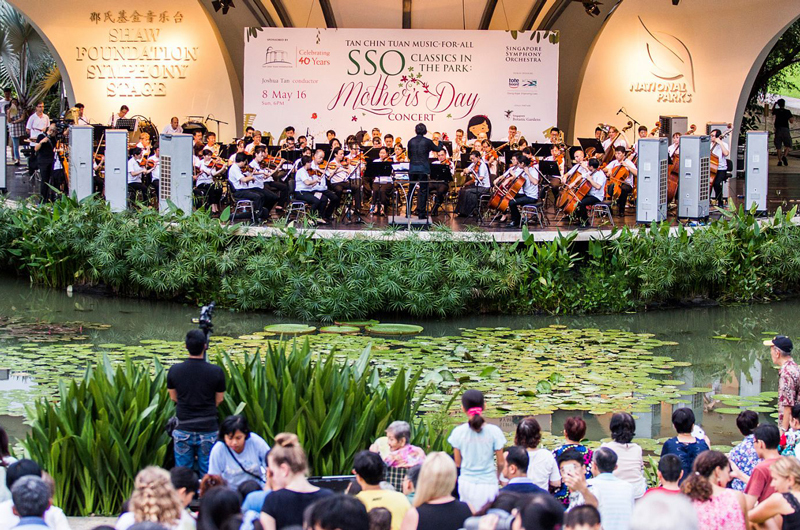 The Mother’s Day Concert will be held at the Shaw Foundation Symphony Stage at Singapore Botanic Gardens on 13 May (Sunday) from 6pm onwards. Click here for more information. Perfect for daredevil mums and adrenaline junkies, nothing says family bonding like screaming your heads off together as you’re launching off on the Giant Swing or shooting down great heights on the Mega Zip. In-between, soak up nature by hiking up the Imbiah Trail and take in the breathtaking views on the MegaClimb. Plus, from now till 31 May, mums get to enjoy 50% off any package with purchase of any full priced package at Mega Adventure Park. Head here for more info. The heart-warming Mandarin musical, Super Mommy, has arrived on our shores, and Mother’s Day weekend is definitely the perfect time to watch it. Unlike what its title suggests, this play isn’t about superheroes or mothers (not exactly). Set in a multi-generational household, the production explores the lives of a dual-income family struggling to cope with their jobs, care for their young son and an elderly family member suffering from dementia. Centred around various social issues many families face today, Super Mommy is a great way to tackle difficult topics with the kids and help them understand different perspectives. Super Mommy runs from now till 22 June. Tickets start from $58, head here for more info. Want to escape the crowds this weekend? Opt for a stay-home Mother’s Day where all that’s on the menu is binge-watching shows and ordering food delivery! For mums who are especially into K-dramas, catch up on all your favourite shows by purchasing a 12-month Viu premium subscription at 30 per cent off with the promo code <VIUHAPPYMUM>. Enjoy unlimited downloads, all-access pass, ad-free and priority viewing for you to indulge to your heart’s content. Happy Mother’s Day indeed! 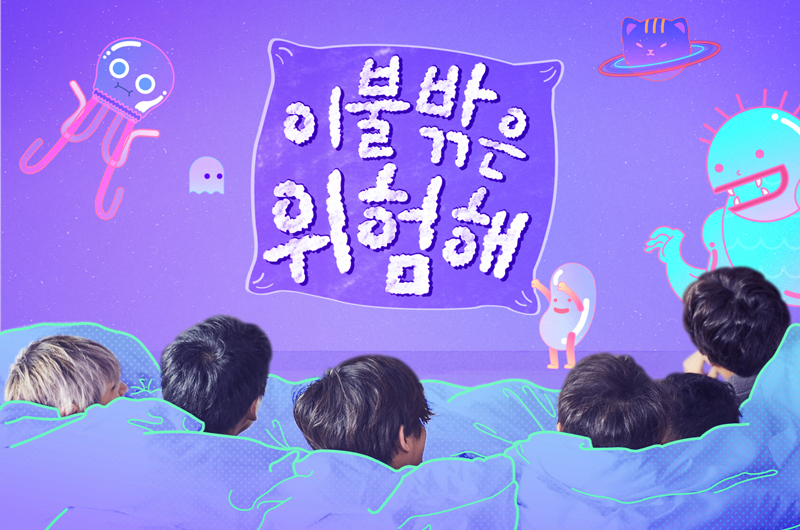 The Viu promo is valid from now till 15 May 2018. Apply the promo code upon checkout from the Viu e-store.